The complete META shelf rack package, with its uncomplicated boltless system, can be installed simply, quickly and securely. It is also corrosion-resistant, as it is made from galvanised steel plate. The complete package of META one-sided cantilever racks combines safety and load capacity with versatile storage options for long and unstable goods and raw materials. Snap up this complete package and benefit from the many possible applications. 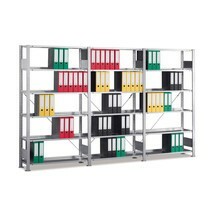 The complete META file rack package with 6 shelves can be quickly and simply assembled with the uncomplicated boltless system and also individually modulated. It is manufactured in galvanised steel plate and therefore resistant to corrosion. The complete META shelf rack package is an uncomplicated boltless system, which can be installed simply, quickly and securely. It is also corrosion-resistant, as it is made from galvanised steel plate. Thanks to the user-friendly boltless assembly system, you can erect this shelving in a flash and entirely without tools. 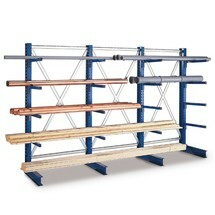 You will benefit from a premium quality META shelf rack that will provide years of valuable service. 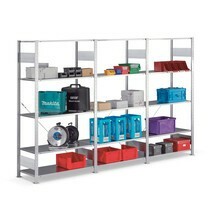 This complete shelving package with steel plate decks is made from galvanised steel and offers a quick and flexible storage solution thanks to the bolted assembly system. The configuration of the shelves can be tailored to your requirements, thus ensuring the perfect setup for your storage area. Available in many different versions. The complete META shelf rack package can be quickly and simply assembled with the uncomplicated bolted system and also individually modulated. It is manufactured in galvanised steel plate and therefore resistant to corrosion. 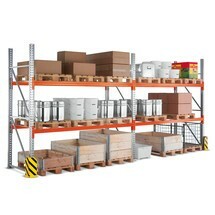 The complete META shelf rack package with a shelf load of 230 kg convinces with its uncomplicated boltless system, which can be installed simply, quickly and securely. It is also corrosion-resistant, as it is made from galvanised steel plate. The uncomplicated boltless system for the META shelf rack package with simple, quick and secure assembly. It is also corrosion-resistant, as it is made from galvanised steel plate. The side walls and base of this stacking container are perforated, thus providing well ventilated storage for foodstuffs. The polyethylene material is resistant to most oils and acids. Expand your storage options with robust polyethylene stacking containers. Thanks to the closed side walls and base, the stacking and nesting containers are also suitable for storing small parts. Store foodstuffs and other goods in a food-safe, reusable stacking container made from polypropylene. The included label slot ensures that you always have a clear overview of your stocks while also enabling straightforward transport documentation. 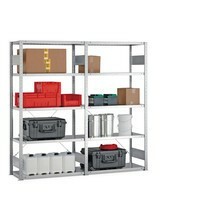 This complete package from META provides you with a multifunctional shelving system. Installation is a breeze thanks to boltless assembly. The META shelves enable flexible configuration, while the galvanised surfaces ensure a long service life. Accommodate heavy, long goods in a space-saving manner in the base unit of the META cantilever rack with a load capacity of 200 kg. 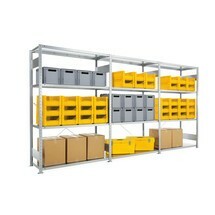 Secure storage is guaranteed by the cantilevers welded to the uprights and roll-off protection on each arm.